This tip is a continuation of my article this month describing a recent trip for lakers to Cold Lake, Alberta. 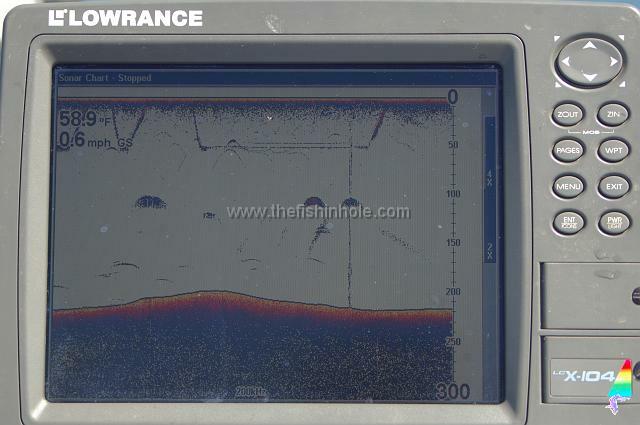 To help with this explanation I took a picture of my sonar and will describe the events that appear as the fish is being caught. 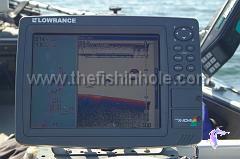 You will see a fish echo along with the flat line that indicates where your downrigger is tracking. 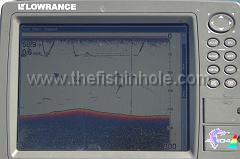 The fish echo then flat lines just below the downrigger line indicating that it is following the lure behind the downrigger’s ball and release. The vertical line of static appeared when Justin (who was sitting at the helm) said that there was a fish following and for me to be ready as he was going to hit the throttle and turn hard - the static comes from noise created by the engine. I braced my knee against the side as I was standing in anticipation of the speed surge. 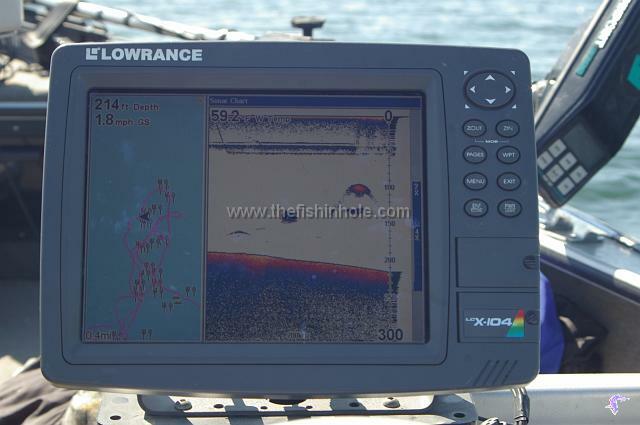 Immediately following the acceleration the fish hit the lure. It happened to be my turn at the rod and as soon as Justin had the boat out of gear, he moved to get the downriggers up and out of the way indicated by the line that goes up at an angle. The bigger echoes that look like clouds are bait fish and the individual echoes far deeper are presumably, for the most part, lake trout - all neat stuff.